DataSunrise Data Audit for Azure SQL limits sensitive data exposure by masking it to non-privileged users. Instead of genuine information users get fictive, yet realistic looking data. Masking is performed dynamically at the moment of a request, so there is no need to create a copy of the database or use any additional resources. Use a set of pre-defined masking rules or create one adjusting your requirements via a graphical interface, selecting what part of data must be concealed and from which users. Let’s see how it works by the example of the following table. 1) Enter Masking section of DataSunrise GUI. Create a rule for each column you need to hide. 2) Add users you need to hide the data from. 3) Select the type of obfuscation (there are pre-defined patterns for email, credit card masking, etc.) or choose ‘Fixed String’ and set the mask value yourself. 4) There is an opportunity to customize the soft to send notifications via SMTP or SNMP whenever masking rule is triggered. Switch it on if required. As you can see all selected columns are obfuscated, so that unauthorized users can’t see the real data. There is no need for data to be genuine, but it must be consistent enough to support proper functioning of the outsource party’s application. 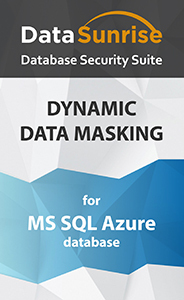 DataSunrise Dynamic Data Masking for Azure SQL is a great solution for access privilege assignment when a company has to protect the confidentiality of data from third-party specialists working with corporate database.